Are you looking for something to do around Melbourne? Do you love watching wildlife? Then let me share with you one of my favourite outdoor activities in the area. Every year when the weather starts warming up, I resume going for a paddle on the Yarra River, specifically to observe the Grey-headed Flying Foxes – also known as fruit bats. Ever since I arrived in Australia and witnessed flocks of individuals leaving the comfort of their trees at dusk and flying across the city sky, I’ve been fascinated by these big but gentle creatures. Soon after, I was amazed to discover that there are places around the city, both on land and on water, where wildlife lovers can go and get a sneak peek of a day in the life of these unusual mammals. My favourite way to reach the area where they roost during the day is by kayaking on the Yarra, which I do from Kew. Once at the bat colony in Yarra Bend, I love sitting in my kayak close to the trees and watching their behaviours. Their numbers, fluctuating seasonally and annually but reaching 40, 000 in the busiest times, never fail to amaze me. Most of them can be seen sleeping upside-down in trees during the day with their wings wrapped around their bodies, but they can also be observed fighting when their neighbours get too close, carrying their babies around during summer - the flying foxes’ busiest season - or swooping low and skimming the water with their bellies when it gets hot. As well as the bats, a variety of waterbirds can be spotted here, including ducks, cormorants and darters, providing good opportunities for keen photographers - don’t forget your dry bag if that’s you! It’s fairly easy and inexpensive to hire boats including kayaks and be provided with lifejackets at the Fairfield Park or Studley Park Boathouses, although I personally leave from the Fairfield Boathouse. I always plan on hiring a kayak for at least two hours - sometimes longer if I can afford it - so I don’t have to rush and can spend plenty of time at the bat colony. I found that, depending on fitness level, it is feasible to reach the colony and get back to the boathouse in one hour, but it doesn’t allow much time for wildlife viewing. Pretty keen? Remember to check the weather before going, and also bear in mind that flying foxes are very sensitive to heat events and should be left undisturbed at these times of year in order to better protect them. Elodie came to Australia where she recently completed a PhD in seabird ecology at Deakin University, after studying marine biology in Europe. She is passionate about the natural world and its protection. She is also a dive instructor and Emergency Response Operator at Wildlife Victoria. You can find her on Twitter at @ECamprasse. All images courtesy of Elodie Camprasse. This is a guest post by Mackenzie Kwak. These days there’s a lot of buzz surrounding pollinators. When most of us think of them, our minds quickly turn to bees and butterflies. However, in Australia we have a diverse range of warm-blooded pollinators working through the night to keep our forests growing strong, and many of them call our city home. Australia is a global hot spot for mammal pollinators. To better understand the close relationships between these warm-blooded creatures and their floral friends, we must turn our minds back millions of years to prehistoric Australia when flowers first appeared on the continent. For a very long time before the present day, Australia sat much farther south and at one point even stood where Antarctica now rests. At that time though, the globe was much warmer and plants could survive on this cool, southern continent known as Gondwana. Although polar forests flourished, temperatures still remained low, especially in winter when the forests often froze over. This provided a real challenge for plants eager to be pollinated. Insect pollinators were not common in Gondwana at this time due to one basic problem with their biology: cold blood. Insects are commonly described as cold-blooded or more accurately poikilothermic, meaning their body temperature fluctuates with the ambient temperature. However, insect body temperature can fluctuate so much that sometimes it rises far above that of mammals and birds, making the term ‘cold-blooded’ a little erroneous. Fluctuating body temperature creates some major difficulties for insect pollinators - especially when the ambient temperature is close to freezing and pollination activity becomes impossible. It was these cool conditions that gave mammals their first real go at pollination in Australia. Mammals are warm-blooded, or, more technically, homeothermic, and can control their internal temperature even when the ambient temperature majorly fluctuates. This means that they remain active at much lower temperatures than their six-legged competitors and can exploit the rich nectar resources that plants have to offer. Over time, many mammals specialised to feed on this rich food and plants in turn modified their flowers to attract warm-blooded pollinators. Possums are perhaps the most commonly encountered native mammals in the greater Melbourne region. Most folks view them with a strange combination of weak interest and mild irritation because of their all too common habit of taking up residency in our roofs. Possums, though, are important pollinators of many native trees and shrubs throughout Australia. We are most familiar with the common brushtail possum (Trichosurus vulpecula) and common ringtail possum (Pseudocheirus peregrinus) that are regular visitors to the flowers of gum trees. But while these two species supplement their diets of leaves with whole flowers, nectar and pollen, the real heavy lifters among the pollinating possums are the gliders. In the greater Melbourne region the most common of these is the sugar glider (Petaurus breviceps), which incorporates a huge amount of pollen and nectar into its diet along with insects and tree sap. These little possums live in family groups, reside in tree hollows, and are important pollinators of Eucalyptus trees. Melbourne is also home to the world’s smallest glider, the feathertail glider (Acrobates pygmaeus), which weighs about 14 grams and is small enough to fit in the palm of your hand. While these little possums are far from common, they can still be found in the forests near Frankston and in Melbourne’s north-east. Like the sugar glider, they are also voracious pollen feeders but supplement their diet with insects. Bats are another group of mammal pollinators often viewed with some antipathy by the general public because of their noisiness and propensity towards raiding fruit trees. However, bats are much more important to Australia’s ecosystems than many people realise. It’s important to note that the majority of bats that call Melbourne home do not act as pollinators - these are the microbats and they are in fact carnivores or insectivores. The grey-headed flying fox (Pteropus poliocephalus) is Melbourne’s only bat pollinator and reaches sizes far greater than its small carnivorous relatives, with wingspans up to one metre. Grey-headed flying foxes feed on a range of different flowers throughout the year but particularly favour the Myrtaceae family which includes the eucalypts, honey myrtles and tea trees, as well as the Proteaceae which includes the banksias and grevilleas. Fruit bats are not only important pollinators, but also critical seed dispersers for many native plants as well. Perhaps the strangest mammal pollinators to call the Melbourne region home are the Dasyurids, a group which few people have even heard of let alone considered as pollinators. For those unfamiliar with the often complex world of mammal taxonomy, the Dasyuridae is a family of mammals that includes quolls, Tasmanian devils, the now extinct Tasmanian tiger, and a range of other small, carnivorous marsupials. Many small Dasyurids resemble rodents superficially, but all possess a pouch which sets them apart. The genus Antechinus is one of these rodent-like groups of marsupials and Melbourne is home to three species: the swamp antechinus (Antechinus minimus), dusky antechinus (Antechinus swainsonii) and agile antechinus (Antechinus agilis). In other parts of Australia, Antechinus species are known as excellent pollinators of Banksia sp. but it remains unclear what role our Melburnian species may play in the pollination of local flora. One Melbourne resident known to be a good pollinator is the brush-tailed phascogale, which resembles a squirrel but is actually a nocturnal, carnivorous marsupial. These secretive little mammals have been recorded gorging themselves on nectar and pollinating flowers with masses of pollen adhering to their furry muzzles. However, like many of our shy native marsupials, it is believed that the brush-tailed phascogale is sadly declining around the Melbourne region due to habitat loss. So next time you see fruit bats glide overhead or hear a possum scurry across your roof, just remember the surprising task that these pollinators undertake. Although they may not be as glamorous or well-liked as native bees or butterflies, mammals are key pollinators of many of our native plants. It's now our responsibility to halt their decline, as losing them could be catastrophic. Mackenzie Kwak is a zoologist with a broad interest in Australia's diverse flora and fauna. His research focuses on the biogeography, systematics and ecology of Australasian ectoparasites, particularly ticks, fleas and lice. Banner image of a grey-headed flying fox courtesy of Wikimedia Commons. With Melbourne’s warmer weather fast approaching, a unique little Australian mammal fills the night sky with a quirky array of sound and colour. The grey headed flying fox is a megabat only found along the East coast of Australia. Sporting a distinctive grey head and orange-brown collar the grey headed flying fox is a keystone species to our forests and is our only long distance pollinator, flying up to 50km in one night, and maintaining the biodiversity and health of forest ecosystems. Victoria’s largest colony of grey headed flying foxes is located at the Yarra Bend reserve in Kew where up to 30,000 bats roost in trees along the Yarra River. Unfortunately despite having large, seemingly stable populations, Melbourne’s grey headed flying foxes are faced by a couple of major threats. With rising temperatures and increasing urban growth, this species which once numbered in their millions are facing massive population declines with as few as 400,000 grey headed flying foxes remaining in the wild. Humans and flying foxes share a similar preference for where to establish their homes. Because of this, increasing human populations and expanding urban sprawl have impeded greatly on the habitat of grey headed flying foxes, pushing their colonies to relocate each time their homes are destroyed. Prior to the 1980s we had very few flying foxes in Melbourne because the winter climate was too cold for the bats to remain year round, but by 1986 warmer temperatures and a significant increase in the number of feed trees available to these pollen and nectar loving creatures allowed the first colony of flying foxes to establish in the heart of Melbourne. By 2003 the population of grey headed flying foxes in Melbourne had quickly grown from only 15 bats to over 30,000 individuals. Unfortunately with bats living so close to us and in such large numbers, there’s often a lot of conflict between humans and bats. Flying foxes are frugivores and as such they feed on the fruits of many trees grown by landowners and farmers. For this reason many people hold a negative perception of flying foxes without understanding just how important these creatures are in maintaining the health and biodiversity of our gum forests. Most times humans and urbanisation pose one of the biggest threats to our flying foxes with shooting still legal in certain areas, powerlines causing electrocution, and entanglement from fruit tree netting being just a few of the dangers our bats are faced with. The other key threatening process that our bats face is global warming. With temperatures rising at an unprecedented rate each year, our flying foxes are acting as the ‘canaries in the coalmine’ of the climate crisis. Unlike humans, flying foxes lack the ability to sweat, and with temperatures rising so rapidly they haven’t had time to adapt. For the grey headed flying fox temperatures over 42 degrees are considered days of extreme heat where these creatures suffer from severe heat stress and are often seen dropping from the trees out of exhaustion. Global warming is one of the biggest drivers of population declines of our already vulnerable flying fox colonies. Maintaining flying fox colonies is extremely important, as without these animals we would be without the financial or physical means to do the sheer volume of work that these bats perform every night, at no cost, to conserve our forest ecosystems. Luckily for these creatures there are many organisations dedicated to ensuring their survival such as the Australian Bat Society and the Australian Research Centre for Urban Ecology who perform monthly bat counts to monitor the success of Melbourne’s Yarra Bend population. The next megabat count is on the 8th of October, and the group are always looking for volunteers to help out. To get involved you can contact the counts organiser Rod on 0412 562 429. Image Credit: Alison Kuiter, Animalia wildlife shelter. It’s September and the weather is finally warming up! Many plant and animal species come out of their winter dormancy at this time of year. Road traffic will soon be held up by hoards of ducklings, possum joeys will start falling out of trees, and everyone will need to dust off the old anti-magpie helmet. However, one species will go about its springtime business largely unnoticed. Nodding Greenhoods (Pterostylis nutans) are flowering right now, all over Victoria. 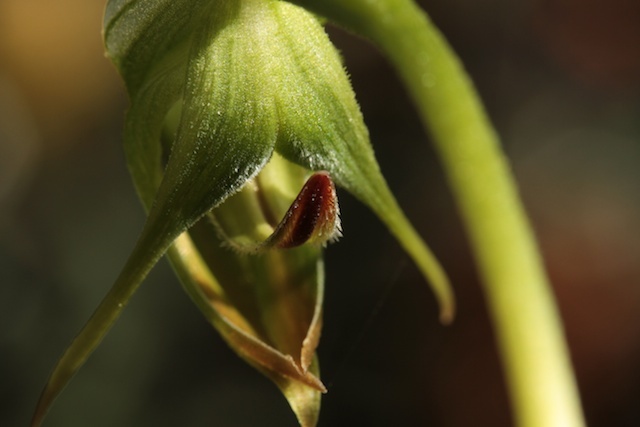 Nodding Greenhoods, also known as Parrot’s Beak Orchids, are a relatively small orchid that grows up to 30cm high, with flowers up to 25mm long. Each plant bears a single flower, which are easy to overlook as they are green and translucent. Their name refers to the way the flower droops over, causing it to look like a hooded figure (or a parrot’s beak). At the base of the flower stem is a rosette of three to six oval leaves. Nodding Greenhoods are found throughout most of Victoria, excluding only the dry north-western corner of the state. In regards to Melbourne, this species once inhabited much of the eastern and southern parts of the city, and today can be found in numerous parks and reserves. Nodding Greenhoods can be found throughout the Dandenong Ranges, south to Frankston and surrounds, and as far west as the CBD. Most recently I found them at Baluk Willam Nature Conservation Reserve - an absolute must-see for anyone who is interested in Australian orchids. This reserve is home to 73 orchid species - that’s over one third of Victoria’s orchids all in the one spot! Nodding Greenhoods are locally common, forming large colonies on moist, sheltered sites in a wide range of woodland and open forest habitats. Nodding Greenhoods are able to reproduce both sexually and asexually. This means that they produce seeds, but also form clonal colonies. This species has a long flowering season, some plants flowering as early as May, others as late as December. The flowers of Nodding Greenhoods are not at all spectacular or eye-catching. Instead, this species attracts its pollinators (namely male fungus gnats) by exuding a scent that mimics the pheromones released by their pollinators’ female counterparts. The male fungus gnat lands on the touch-sensitive labellum (a modified petal), which catapults and temporarily traps the gnat against the column (an organ that both distributes and collects pollen). As the gnat struggles free, it picks up and deposits some pollen, escapes the flower, and then moves on to the next orchid. This is sexual deception as its best - Greenhoods do not produce nectar, so the gnat does all the work of pollinating the Nodding Greenhoods, but alas receives no reward. As this species exists in relatively dry, nutrient-poor habitats, it has evolved a few mechanisms to help it survive. All Greenhoods are deciduous, meaning that for much of the year they exist as tubers in the soil, avoiding the hot and dry periods that occur over much of Summer and Autumn. Another mechanism that assists in water conservation is the rosette of leaves at the base of the flower, which helps to funnel rain towards the centre of the plant. The water then falls between the leaves at the centre of the rosette to the ground, and is absorbed by the plants roots. In order to combat nutrient-deficiency, Nodding Greenhoods have evolved a mycorrhizal relationship with fungi in the soil. This allows the orchid to exchange photosynthesised organic matter with the fungi in return for inorganic nutrients that the fungus is able to extract from the soil. This hardy little orchid is inconspicuous and quite boring when you first look at it, but it has a pretty interesting lifestyle. If you find yourself out in the forest anytime soon, make sure to look down. There may be a Nodding Greenhood at your feet - but hopefully not under them!